Tamil Nadu has been chosen in large category food production. Krishi Karman awards were instituted by the Union Ministry of Agriculture and Farmers Welfare to reward the best performing States in the production of food grains and individual crops of Rice, Wheat, Pulses and Coarse Cereals. Dr. Paduru Gururaja Bhat Award 2017 has been conferred for Prof. A.V. Narasimha Murthy. Murthy was selected for the award in consideration of his contribution to Indian Archaeology, Ancient History and Numismatics. Dr. Paduru Gururaja Bhat Award 2017 The award was instituted by Udupi-based Dr. Paduru Gururaja Bhat Memorial Trust. 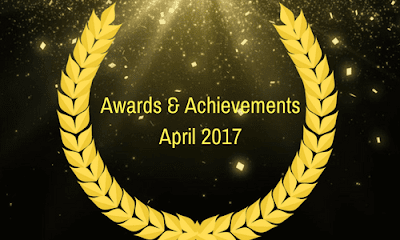 The award recognizes outstanding contributions in the field of history, archaeology, sociology, and other social sciences. She was described as a symbol of the most important thing in the world-education for all. With this she became youngest ever UN Messenger of Peace. The UN Messenger of Peace title is given by UN and are selected from the fields of art, literature, music and sports or other fields of public life. The messengers of peace are appointed directly by the Secretary-General of the UN and to promote the work of the United Nations in general. Fiction: The Underground Railroad by Colson Whitehead. Drama: Sweat by Lynn Nottage. History: Blood in the Water: The Attica Prison Uprising of 1971 and Its Legacy, by Heather Ann Thompson. Autobiography: “The Return: Fathers, Sons and the Land in Between”, by Hisham Matar. General Nonfiction: Evicted: Poverty and Profit in the American City, by Matthew Desmond. Music: Angel’s Bone, by Du Yun. Actor Aamir Khan and cricket icon Kapil Dev will receive the 75th Master Dinanath Mangeshkar AwardsAmir Khan will be honoured with the Vishesh Puraskar for Best Film "Dangal", while Dev for his outstanding contribution to Indian Cricket. SBI gets new logo and enters in the league of top 50 Global banks. American singer and songwriter Bob Dylan accepts Nobel Literature Award. Asia’s longest tunnel 9.2km long on Jammu – Srinagar Highway. IISc Bengaluru ranked best educational institution by HRD Ministry. Nobel laureate, the youngest person to address Canadian parliament- Malala Yousafzai. Short film ‘Avyakta’ by 26 year old Omkar Modgi made it to the much acclaimed Cannes Film Fest 2017. India ranks 3rd for the 3rd year in a row in WADA doping Charts. Geetha Johri is the 1st Woman Police Chief in Gujarat. M S Dhoni Indian cricketer named as CEO of Gulf Oil for 1 Day. India ranks 7th in world’s largest tourism economy in terms of GDP. Virat Kohli crowned Wisden’s “king of the willow” for 2016. India’s 1st transgender Police Officer appointed in Tamil Nadu is K Prithika Yashini. India ranks 40th in WEF’s global travel and tourism competitive index. Britsh Indian educationalist Asha Khemka named “Asian Business Woman of the Year”. Atu Zumvu becomes 1st Nagaland Cop to receive “Shaurya Chakra” award in Rashtrapati Bavan. Actor honoured with Living Legend Lifetime award from Punjab Association is Dilip Kumar. Person honoured with Young Scientist Award of National Geoscience Awards 2016 is Dr. Abhishek Saha. Haldia Port tops list in 1st ever ranking of Ports on Sanitation Parameters. India won 5th edition Asian School Hockey Champ 2017. Indian Billionaire who became the 2nd largest shareholder in Anglo-American after acquiring 11.44% of British Mining Group is Anil Agarwal. Indian environmental engineer who won the 2017 Cartier Women’s Initiative Award is Trupti Jain. BMEL bags Hindustan PSU award. India jumps to 8th place on Global FDI Confidence Index.